PORT MORESBY:Opposition Leader Hon. Don Pomb Polye today led his staff to participate in a free diabetes blood checks, organized by the Diabetes Association of PNG and Gerehu Medical Centre as part of the World Diabetes Day 2016 campaign for advocacy and awareness of the disease. In a statement given to the public and media representatives at Jack Pidik Park this afternoon, Polye stated: “Today is World Diabetes Day. There are many more than 400 million people diagnosed with diabetes around the world, with it causing 1 in 4 people to die every second. This is shocking. Polye said that in PNG diabetes is also another major health issue. “Diabetic Association of PNG tells us that diabetes is a very common yet silent killer! All Papua New Guineans should know that diabetes is one of the most prevalent non-communicable disease (NCDs) affecting many of our people each day. It is sad to note that many of our people are unaware that they have the disease and are diagnosed only after experiencing serious sickness, such as kidney, heart or eye problems which are in fact complications from untreated diabetes. 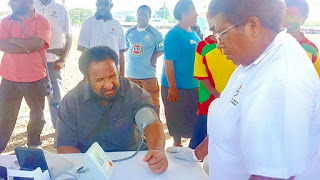 Polye, speaking to members of the public who witnessed his presence at Jack Pidik Park, said: “So what is diabetes? According to the World Health Organization Diabetes is a serious chronic diabetes that occurs either when the body does not produce enough insulin, which regulates how the body uses or stores sugar and fat, or when the body cannot effectively use the insulin it produces. There are two major types of diabetes-type 1 which is most frequent amongst children and adolescents and type 2 which is most frequent amongst adults. Diabetes can also affect pregnant women and is called Gestational Diabetes. If undiagnosed it can have serious complications for mother and baby; even death.What caused diabetes? Diabetes is mostly caused by obesity (being overweight), lack of exercise, eating unhealthy (fatty, sugary) diet, smoking, chewing betelnut and excessive drinking of alcohol. What are the symptoms of diabetes? The symptoms of both Type I and Type II diabetes are similar-frequent urination, increased thirst, unexplained weight loss, constant hunger, changes in vision and fatigue (constant tiredness). Mr Polye then acknowledged the work of the Diabetes Association of PNG, the National Department of Health, all hospitals, clinics, doctors, nurses and other health professionals who work hard to advocate and create public awareness of this terrible disease and to treat those affected by it.